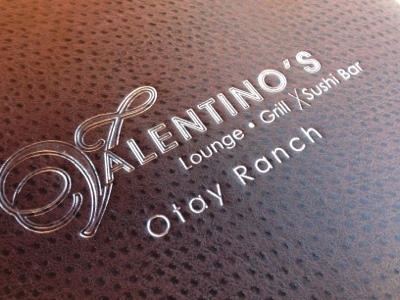 Who would have thought that a sushi bar would be named Valentino's Lounge? When this restaurant first opened, I really thought what I would think everyone would have thought... Italian food! 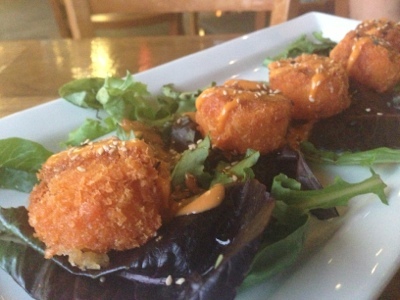 Nope, Valentino's is a lounge, grill and sushi bar that offers good happy hour specials. 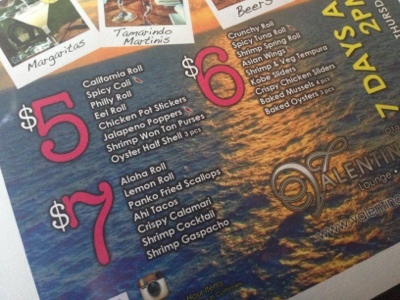 Valentino's offers their Happy Hour menu seven days a week! My BFFs and I met for some much needed girlfriend time for happy hour around 5:30pm on a weekday evening. The restaurant was not busy when we got there... but wow, it got really packed as the night progressed. We sat in the patio and to enjoy the fresh evening air. S told us that we had to order the garlic soy edamame ($4.00), which is not on the happy hour menu. 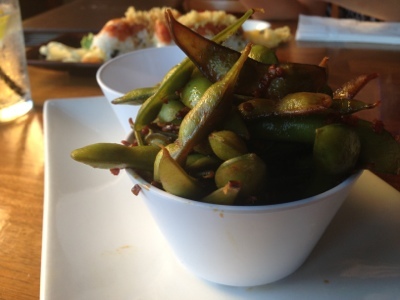 Each edamame pod was soaked in soy sauce and had sweet garlic chunks throughout. These were lovely and a great way to tease my palate before we dug into some of the happy hour goodies. These were my favorite of all of them -- the jalapeño poppers ($5.00). 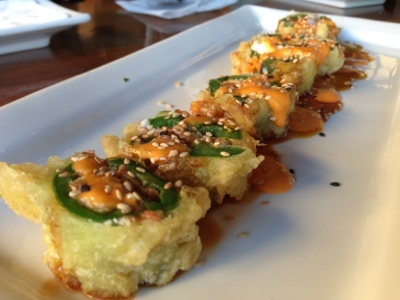 Oh, yeah... deep fried rolls, stuffed with cream cheese, snow crab, spicy tuna, fresh jalapeños, with a drizzle of spicy aioli and toasted sesame seeds. I know, these fun rolls are not authentic, but they sure were delicious! 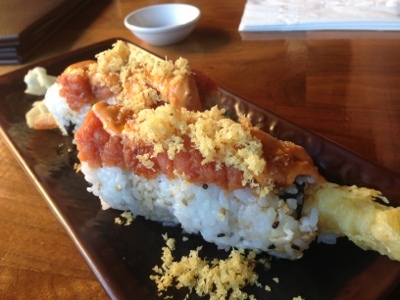 This looks like the spicy tuna roll ($6.00) but I am confused with the big ol' shrimp tempura sticking out of it. This one was pretty good. It has crunchy tempura flakes on top. 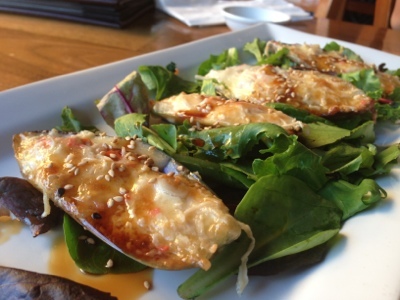 Baked New Zealand Green Lip Mussels (4 pieces, $6.00) had snow crab, dynamite sauce (spicy mayo) and topped with kabayaki (eel) sauce. I love mussels in any type of form, so these were really yummy to me. The dynamite sauce was probably made with Kewpie mayo (Japanese), so there was a little sweetness there. 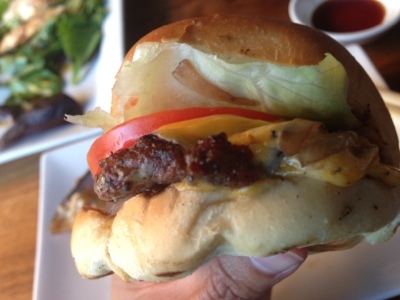 The Kobe Beef Sliders (three sliders, $6.00) were just okay. You can see that the slider bread sizes were really inconsistent and look at the third one on the plate... it was all smooshed when they arrived on our table! 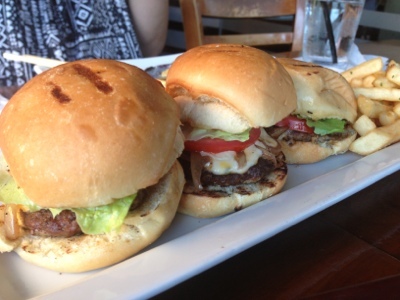 Each slider came with cheese, lettuce, tomato, and balsamic onions. I know, it's ridiculous to get all picky with the knife cuts of the vegetables, but come on... my iceberg lettuce on my slider was just sad and the tomato slice was sliced on a awkward bias. As far as flavor, the patties were pretty well done so I missed the rich, Kobe flavor of the meat. Sorry, I tried to like these. At least we got some french fries on the side, which I pretty much munched on myself. 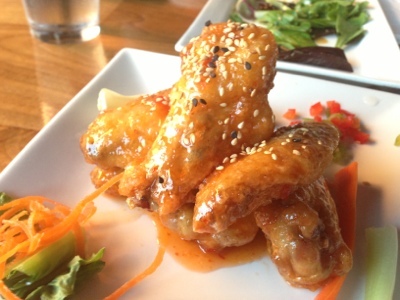 The Asian Wings ($6.00) were deep fried and then tossed with a spicy sesame sauce and topped with toasted sesame seeds. I loved these! The final dish that we ordered were the Panko Fried Scallops ($7.00). These were simple, sweet and fried to a crisp. S enjoyed one of their famous tamarindo martinis ($11.00) -- I forgot to take a picture of it. She loved it so much that she had two of them. My BFFs and I had a great time here, just updating each other on life, our families, and our kids. Great place to meet friends for a cocktail or beer and to enjoy HH dishes! Ooh, I haven't been here in awhile. Looks they're more "happening" now. It used to be Taste of Italy then changed in 2007 or 2008. It's nice to learn about places down your way since I'm not down there that often, but sometimes need a good place to go when I am! Oh wow, never realized something was there before them!